SPANAWAY – Carly Cappetto’s fingers twisted into knots early Thursday as she scanned the crowd of students waiting to enter Evergreen Elementary. It was the first day of school. Cappetto, a family-resource coordinator, craned her neck to glance toward the back parking lot, where she hoped to spot one particular school bus unloading its solitary passenger: a fourth-grader, J, alone because she’s coming from a homeless shelter 30 minutes away. Cappetto works with students like J — whom The Seattle Times is not naming to protect her identity — at seven elementary schools. 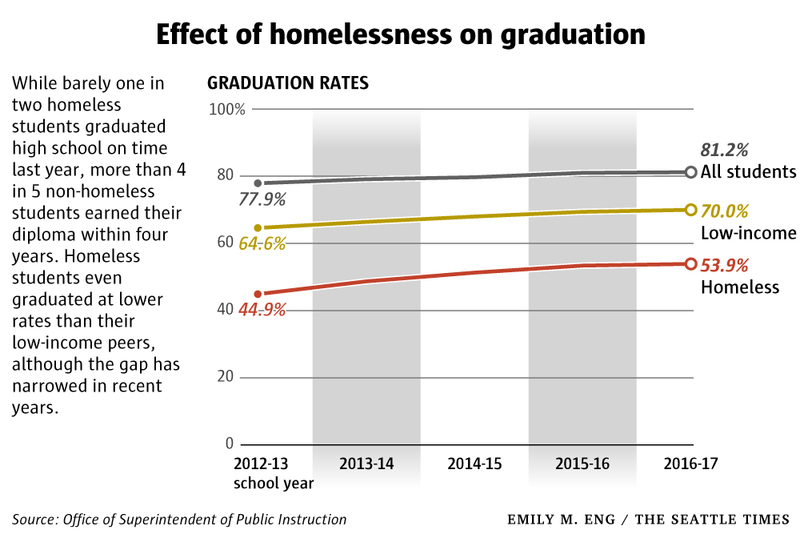 This year poses a particularly daunting challenge: Already, the Bethel School District enrolled more than twice as many new students who identify as homeless than it did last year. It’s a statewide problem that feels especially acute in districts like Cappetto’s, where schools aren’t located in the immediate vicinity of the big cities where homeless services are often concentrated. Over summer break, Cappetto had helped J and her mother secure beds at an emergency shelter after the car they were living in was repossessed. She also connected them to the district’s homeless liaison, who planned which city- and school-bus routes J, just 11 years old, would have to navigate alone to get to school. At the edge of the bus yard, Cappetto checked her watch. When the first bell rang three minutes later, J still hadn’t arrived. Where could she be? 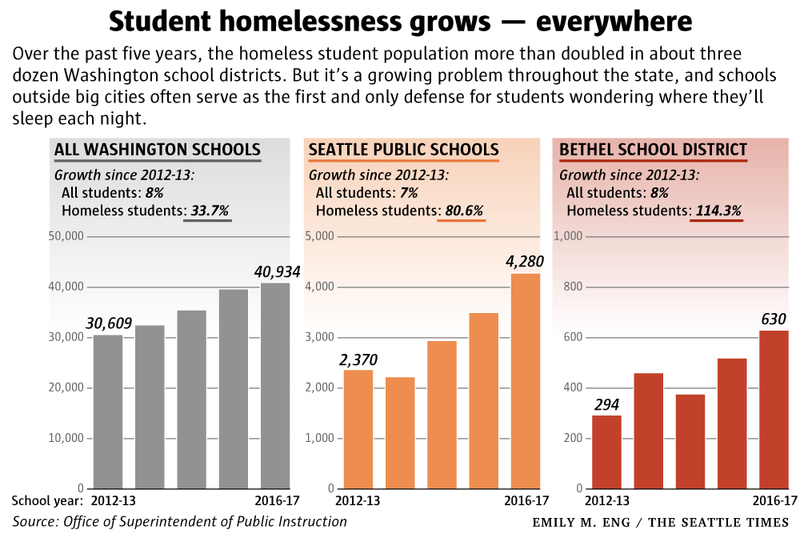 As most Washington children returned to school last week, the number of homeless students continued to overwhelm school districts throughout the state. But as they inherit a problem not of their creation, educators like Cappetto have become the first and, in many cases, only line of defense for students worried about where they’ll sleep each night. “We’re kind of cast adrift out here,” said Bethel schools chief Tom Seigel, whose district, about half an hour south of Tacoma, enrolls some 20,000 students and spans 200 square miles in unincorporated Pierce County. “We don’t have infinite resources to solve problems that are not in our immediate jurisdiction,” Seigel added. These students’ ephemeral living circumstances contribute to some of the worst academic outcomes in Washington: Last year, barely more than half the state’s homeless students graduated from high school on time, compared to 81 percent of their peers — which is to say, these children likely won’t benefit from Seattle’s tech boom and the jobs it has brought to the region. In the shadows of the Puget Sound region’s new skyscrapers, schools have absorbed growing ripples of inequality. In Bethel, homes can span acres, apartment vacancies are hard to come by and mobile home parks hide behind clusters of evergreen trees lining the state highway. District officials embrace Bethel as a bedroom community of Tacoma, where neighborhoods don’t neatly fit within either rural or urban categories. Adding to the pressure on schools: People who can’t afford Seattle are moving to places like Tacoma, and Tacomans who can no longer afford their neighborhoods move to places like Spanaway, according to Jeff Christensen, who’s managed rentals in Tacoma and South Pierce County for more than 40 years. Since 2014, prices at his cheapest rentals — 900-square-foot homes — have gone up 14 percent, the most out of any houses he rents. That’s made even places like Spanaway too expensive for some. Christensen has seen more and more landlords in South Pierce County decide to quit renting and sell their houses because the home prices are higher than ever. And the lower-end rentals have gone up the most. Christensen’s average 1,000-square-foot home — usually perfect for a small working-class family — rents for close to $1,400 now. Around J’s school, Evergreen Elementary, miles away from the nearest family shelters in Puyallup and Lakewood, it’s not uncommon to see several cars parked in front of a single house where multiple generations of a family squeeze together. As one of Bethel’s five family-resource coordinators, Cappetto serves as a one-woman triage center for families in crisis. She starts her days in the gym — at 3 a.m. — where she disengages from the secondary trauma that she absorbs on the job. That stress seeped into Cappetto’s morning Thursday as she waited for J and fielded text messages from her mother. “Please explain the bus ride home,” the girl’s mother wrote from the temporary shelter in downtown Tacoma where Cappetto had been able to find a space for them. Searching for homeless students is common in many schools, where the challenge of serving them starts with identifying families who qualify for limited state and federal supports. The scant federal funding can pay for long bus rides, immunizations, eyeglasses and hearings aids, or a dozen other items and services to make it easier for homeless students to succeed in school. In Bethel, district officials estimate about 100 families last year qualified for those services but, for a variety of reasons, did not want to identify their children as homeless; Some parents decline the help as a matter of personal pride. Others fear their tenuous living situation might risk their children being taken away. And, more common now, immigrant families with mixed legal status hesitate to submit any official government forms. The challenges have forced schools and their partners to get creative: In Kent, the nonprofit Communities in Schools has launched a flexible fund to help pay for car repairs so parents can get to work, or credit repair for families struggling to qualify for an apartment. In Shelton, at CHOICE High School, teachers can send students who need help upstairs to a partner program, Mason County Housing Options for Students in Transition (HOST), where staff find a host family to house the student. 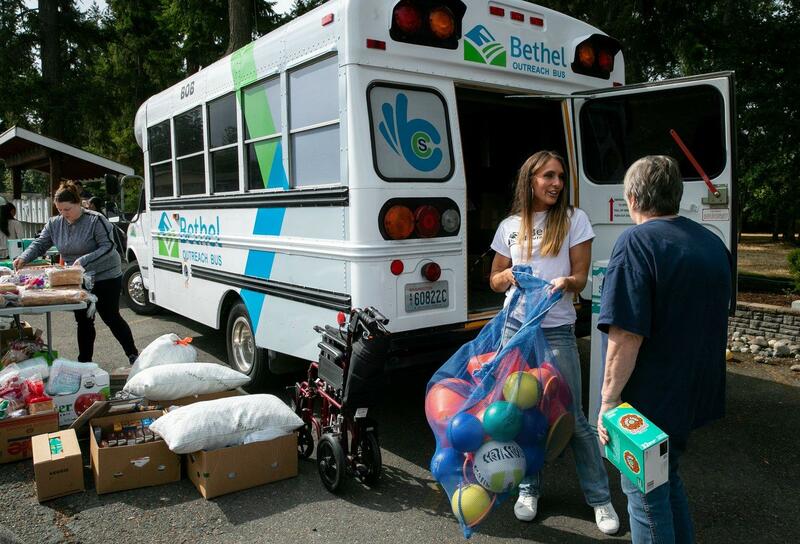 Bethel relies on a converted school bus to win the hearts and minds of skeptical families. Two weeks before school started, Cappetto and district staff drove the bus into a mobile home park where families scoured a collection of donated food, school supplies and hygiene products. Some mothers pocketed a bilingual pamphlet that explained the rights and services that homeless children can access at school. That was all before the school year started. On day one, after checking with the attendance clerk, Cappetto found J in the classroom where she was supposed to be; the pair shared high-fives during a brief chat in the hallway. But her mission was just getting started: later, as Cappetto tried to check on her students at six other schools, she was interrupted by an urgent call from J’s mother: Why exactly was the school nurse demanding J go home early? Cappetto rushed to the school social worker’s office, where she found J waiting for a decision, backpack in hand and ready to leave. “I’m just a whole bunch of problems,” the fourth-grader muttered softly, as she hung her chin low on her chest to avoid eye contact with Cappetto and a school social worker. The nurse soon arrived and explained it was all a mix-up with a doctor’s note. But to Cappetto, the confusion represented a year’s worth of hurdles that J would likely confront this school year. “That poor thing. She’s already had a challenging time just getting here, and then she’s going to be sent home within the hour?” Cappetto asked herself after returning J to her class. Published: Sept. 10, 2018, 9:30 a.m. Updated: Sept. 10, 2018, 10:25 a.m.